Well that was... an idea...: Scraping and painting, and problems with both (now with pictures!). A section of the wallboard had cracked and buckled, probably from someone years ago putting their elbow through the other side of the wall. 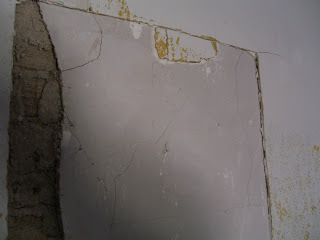 Whatever the reason, I needed to cut the section out down to the plaster. The plan was to buy some drywall or wallboard of the same thickness, tack it into the space, spackle the edges, and paint the whole wall. Unfortunately, this wallboard or whatever is just under a quarter inch thick and something like it probably hasn't been manufactured in years, according to other people who know old buildings. Home Depot certainly doesn't seem to have anything. I'm thinking about just spackling the entire hole, although that seems like a huge waste of spackle, or tacking luan or other wood into the space, although that seems like it will produce a wall with wildly different surfaces. I'm also continuing to hack at the porch. I finished the entire lower rail today, plan to get the entire ceiling done within the next couple of days, but am really not looking forward to dealing with the spindles which have thick paint that is either cracking or not moving.